JEDDAH: A Saudi woman has been honored by a regional innovators initiative launched last July by Sheikh Hamdan bin Mohammed Al-Maktoum, the crown prince of Dubai and chairman of the board of trustees of Dubai Future Foundation. Sadeem Rashed Al-Marri was a winner in the Innovators Under 35 competition at the EmTech MENA emerging technology conference. With her partners, she used 3D-printing technology to create a mechanical hand that can translate Arabic text entered in a specially designed mobile application into sign language. The device has the potential to help millions of deaf people in the Arab world and can also be used to help teach sign language. EmTech, a leading international event dedicated to emerging technologies, was founded in 1999 and the regional edition was held in Dubai for the first time on Sept. 23 and 24, hosted by the Dubai Future Foundation in cooperation with Haykal Media. It attracted 300 participants, including scientists, researchers, industry experts, spokespersons and specialists in a variety of emerging technologies from around the world. The Innovators Under 35 winners also included Taki Hinai and Issa Basaid from the United Arab Emirates, Munther Abu Rumaila and Abdul Mohsin Al-Husseini from Jordan, Marwan Abu Deeb from Lebanon, Abdelkader Nasr El-Din Belkacem from Algeria, Feras Khalifa from Syria, Emad Masoudi from Yemen and Derya Baran from Turkey. The conference showcased the winners in interactive sessions during which they presented their inventions and shared their stories, visions and future aspirations. They have achieved excellence in a range of fields, including biomedicine, computing, energy, communication, software development, infrastructure, and the internet, all of which help contribute to the development of smart cities. The young entrepreneurs will now have a chance to present their innovative ideas to officials, decision-makers and corporate leaders in the region. 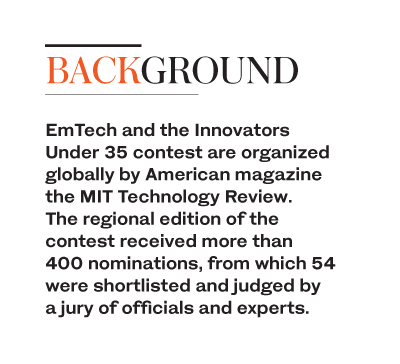 EmTech and the Innovators Under 35 contest are organized globally by American magazine the MIT Technology Review. The regional edition of the contest received more than 400 nominations, from which 54 were shortlisted and judged by a jury of officials and experts. The first Innovators Under 35 list was published in 1999 in the MIT Technology Review, featuring young innovators making contributions that were expected to play important roles in the development of smart cities. The first day of the Dubai conference featured the launch of an Arabic version of the journal, aimed at those interested in emerging technologies in the Middle East and North Africa region. EmTech is one of the most important annual international technology events, with a number of regional editions around the world that showcase the latest inventions and developments. They bring together technology pioneers and businesses to network, share their experiences, learn about innovative technologies and discuss how they might affect communities in the future. Describing the project, Al-Marri said that deaf and deaf-blind persons face many challenges in communicating with others and understanding the world surrounding them. “Although they use sign language or tactile sign language in an attempt to overcome their isolation, they experience difficulties connecting with their community because not all individuals are familiar with sign language or are comfortable with the tactile approach,” Al-Marri said. She added that they attempted, in that project, to solve this problem by designing and building a robotic hand that translates Arabic texts entered in the mobile application into the equivalent Arabic sign language alphabet gestures, that acts as a mean of communication between the deaf/deaf-blind person and the world. Al-Marri told Arab News that a TV interview was the spark that ignited their invention. “A deaf-blind person introduced the challenges that he was facing while communicating with others and understanding the people around him. During that interview, he said that although he used tactile sign language in an attempt to overcome his isolation, he experienced difficulties connecting with his community because not all individuals are familiar with sign language or are comfortable with the tactile approach,” she recalled. Explaining how their invention. works, Al-Marri said that the robotic hand parts are printed using a 3D printer and are connected with servo-motors that act as joints of the hand and attached with strings that act like tendons. “When a user enters a word in the mobile application, a microprocessor sends the appropriate command to the servo-motors causing them to move to pull the attached strings and performing the corresponding sign language gesture,” she said. Al-Marri believes what makes their invention special is that their robotic hand is the first robotic hand that has been used in translating and teaching Arabic Sign Language. “It can be used as an effective 3-dimensional educational tool to teach Arabic Sign Language either for deaf or non-deaf people,” she said. Al-Marri added that in the future they would focus on enhancing the system by making it consist of left and right hands to be able to perform the Arabic Sign Language words. Moreover, she said, the robot can be developed to adapt to any other language. Al-Marri said that she is proud to be one of the young active members of her community in education, technology, and business, where she was chosen by Google to work as a liaison between Google and her university and other organizations. “Furthermore, I was a member of different initiatives that targeted youth technology; in addition, I played a role in startups that worked in innovation and the manufacturing industry and I started my startup in the field of e-learning to contribute to raising student achievement and scientific performance to reach the highest level of his/her aspiring career position using the latest methods in education,” she concluded.